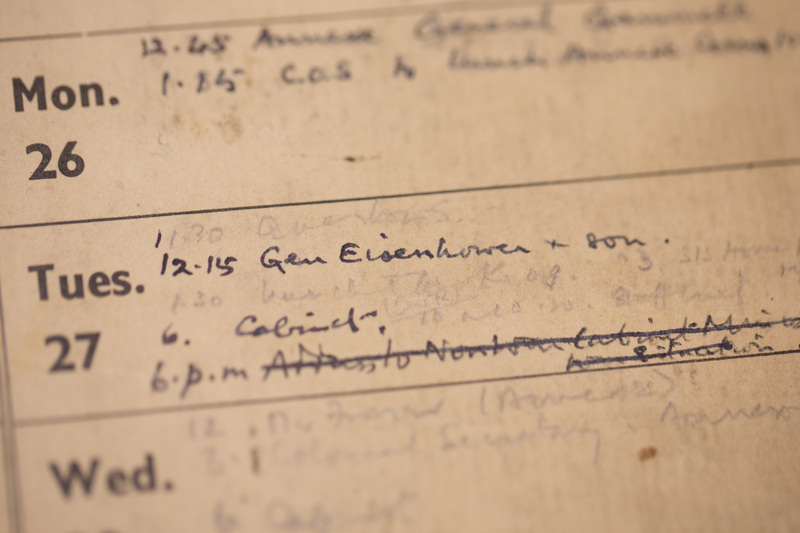 Hidden moments in history are revealed in GW Libraries digital archive project. The date: Nov. 14, 1939. Churchill is first lord of the admiralty, a position he will hold for a scant eight months before becoming British prime minister. Władysław Sikorski is prime minister of the Polish government-in-exile. World War II is 75 days old. 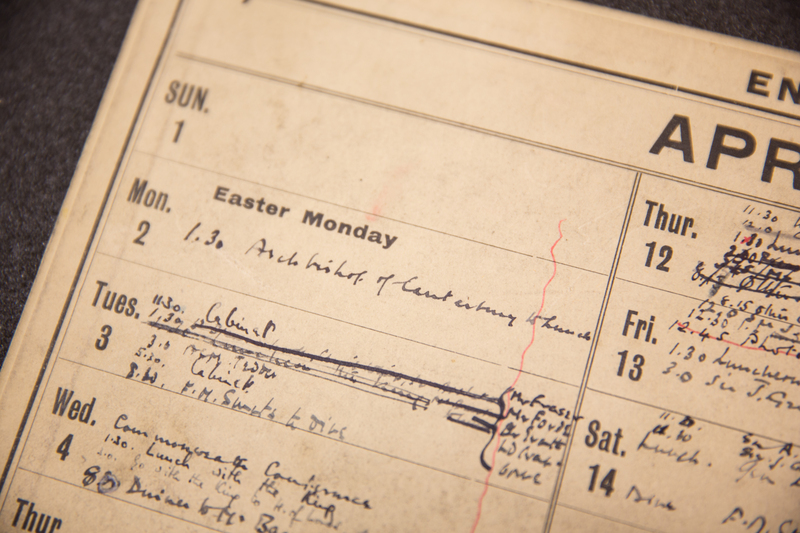 The innocuous appointment in Churchill’s calendar is a window into underground tactics he and others took in resistance to Adolph Hitler and Nazi Germany in the early days of the war. 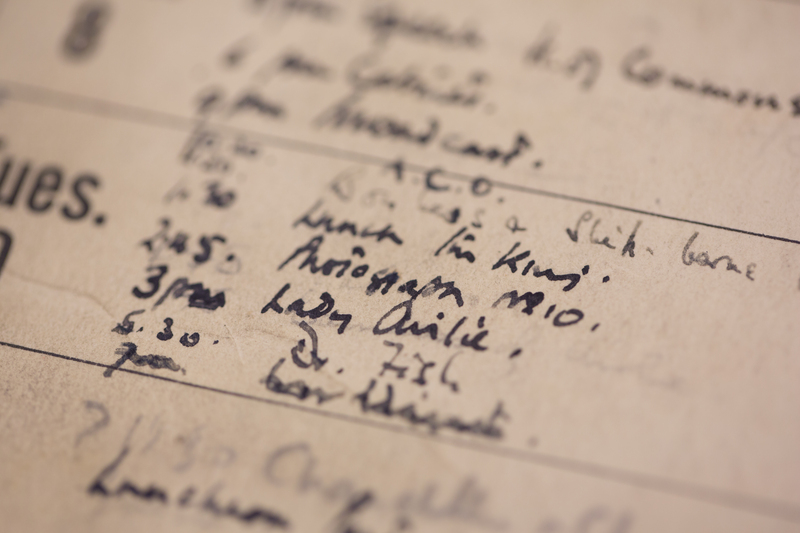 Churchill’s wartime engagement diary, which covers his daily schedule from 1939-45, is filled with thousands of these entries. 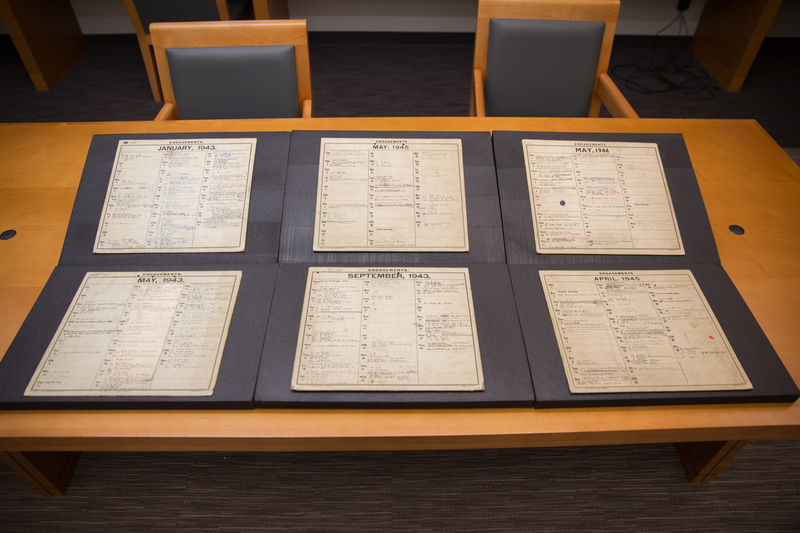 Steve Forbes, chairman of Forbes media, donated the collection of 30 cards to the Chicago-based Churchill Centre, an international education organization that made the initial leadership gift to establish the National Churchill Library and Center at GW. 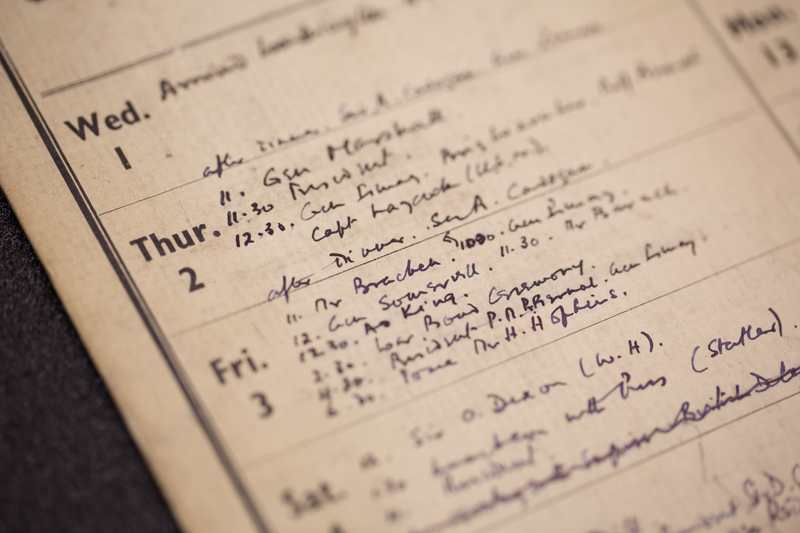 Churchill’s engagement diary was recently donated to GW for use in the center, scheduled to open later this year. 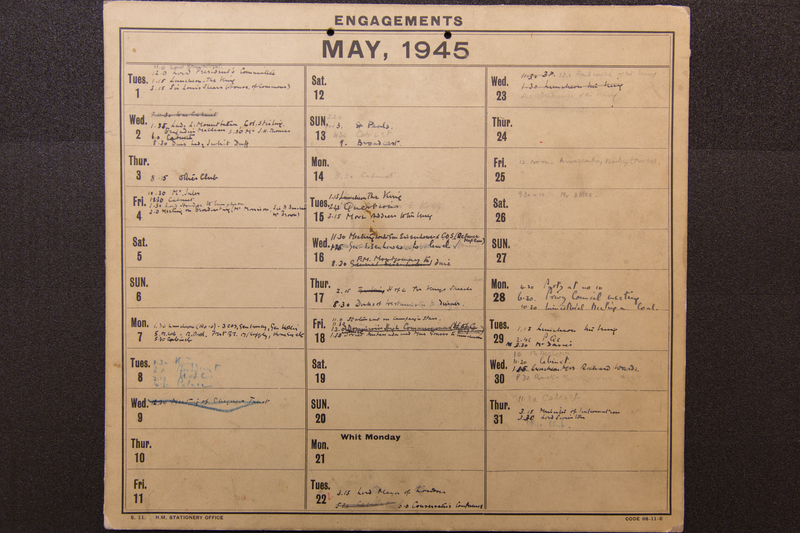 The planner is the subject of a GW Libraries digital history project. GW is crowdsourcing the transcription of the diary, inviting public contributors to help digitize entries. A GW history class is helping with that effort. 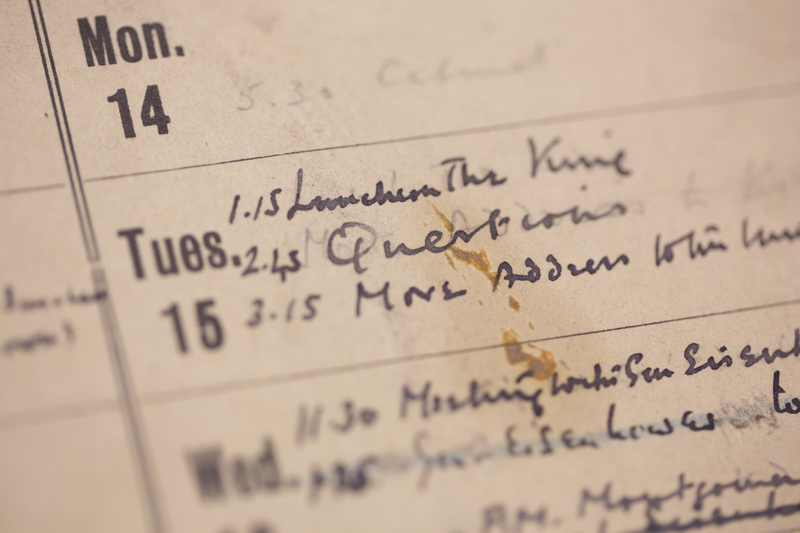 The scribbled notes in the diary contain large quantities of data—patterns and rhythms in Churchill’s daily activities. In addition to transcribing and reviewing material, students in Jennifer Bertolet’s digital history course will pull that data (including dates, times and locations) and map it visually. Large-scale examples of such projects, she said, include the Four Hundred Years website and American Panorama. 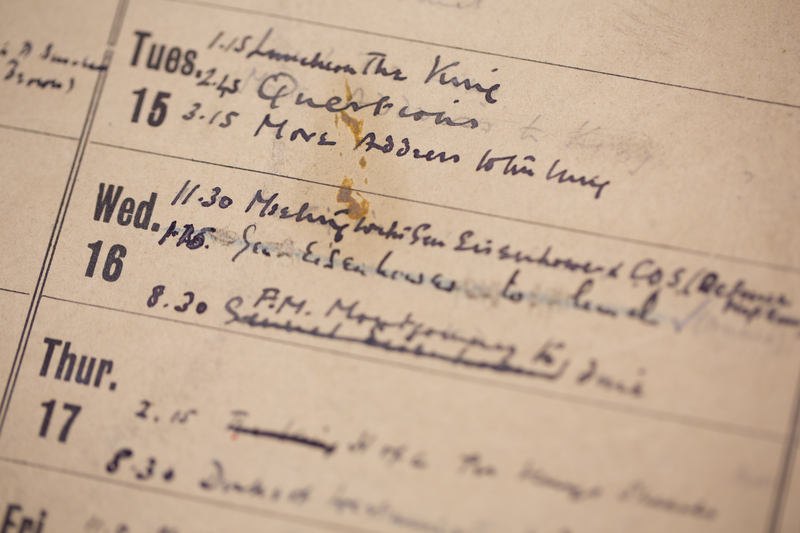 Hidden gems of historical significance and humor are sprinkled throughout the diary. A meeting between Churchill and President Franklin Roosevelt is simply listed as “Hyde Park,” in Churchill’s diary and “HP,” in Roosevelt’s, shorthand for Roosevelt’s private home on the Hudson River. Churchill’s first meeting with Joseph Stalin, a three-day summit in Moscow in August 1942, culminated in a marathon meeting with the Soviet Union general secretary that began the night of Aug. 15. The entry reads: “7-3:30 see Stalin.” We now know, Ms. Trent said, that Stalin and Churchill were up drinking all night and that Churchill boarded a flight at 5:30 a.m. tired and complaining of a headache. 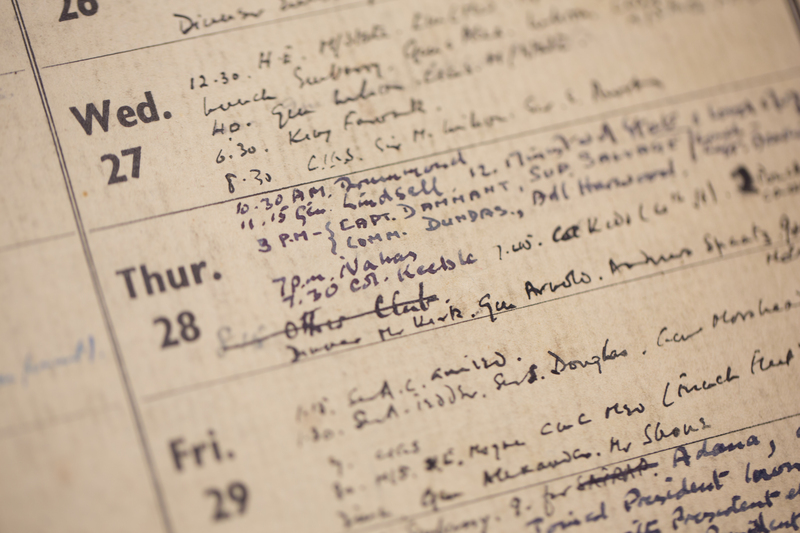 The diary highlights the social and political network of the era, Ms. Kaplan said. The American diplomat W. Averell Harriman, ambassador to the Soviet Union and later the United Kingdom, shows up several times. Lunches, meetings—even social events—are revealed as building blocks to historical events. 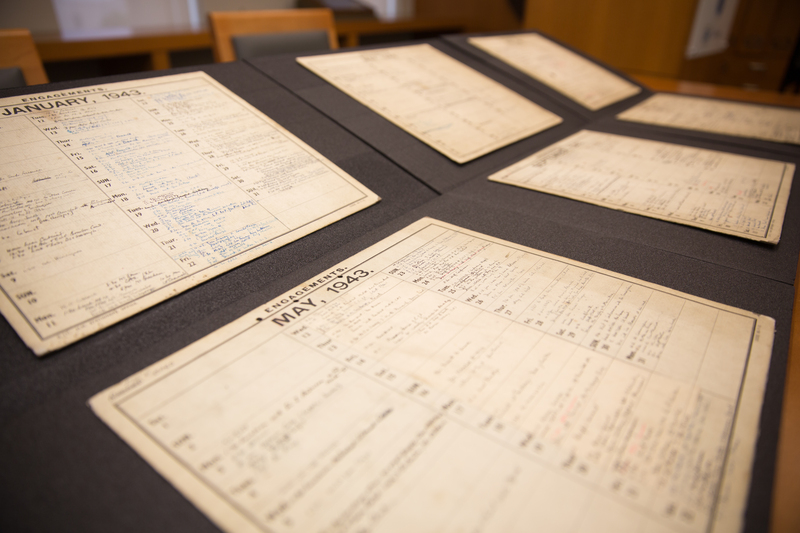 “The thing about primary sources is they are created as life unfolds,” Ms. Kaplan said. “So the significance of events is not necessarily clear in the calendar. It might be a meeting, and you don’t really know what it means. But if you start looking it up, you realize it was the start of a really important conversation that turned out to be a historic event. Event in support of National Churchill Library and Center provides glimpse into complex relationship with the Roosevelts.